Hex Slide 10,000 is an iPhone app with everything a sliding puzzle game ought to be. It was developed by Tiny Bite Games LLC, costs $0.99, and is compatible with an iPhone, iPod Touch, and iPad. 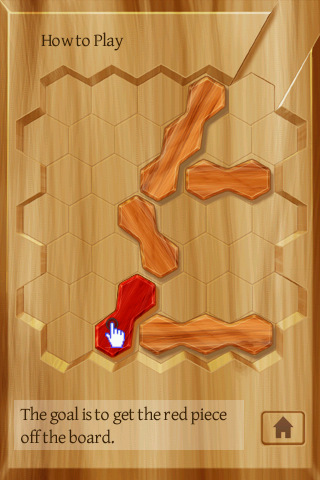 Hex Slide is easily one of the most engrossing app games I have played with. The game consists of hexagonal shapes (Hex) that you have to slide around (Slide) and there are 10,000 (yes, 10,000) different levels. At the beginning of the level the shapes are arranged in a jumble within a closed off hexagonally shaped area. There is an outlet in each level and the player is to guide the one red colored shape out of the area and into the narrow exit. You can move all of the pieces around to try to get a passageway cleared for the red shape. With each level you get three different ratings, perfect playing, great playing, or good playing. If you move too many shapes around unnecessarily then you do not get any rating. 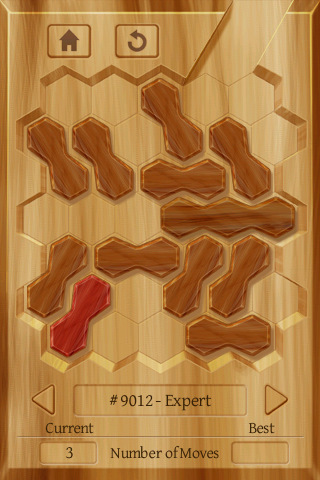 The pieces in the game are given the appearance of being wood blocks atop a wood surface. There are difficulty ranges from easy to nearly impossible. One of the best aspects of this app for me was that I can listen to my iPod while playing, which is a feature that not many games have. In options you can play with the block color and turn the sound on and off. While you are playing, the app displays how many moves you have made and what level you are currently on. You can skip around and try to complete any of the 10,000 levels that you want. There is a Master Grid that is color-coded and has recorded each level you have completed and what rating you got on that level. I have literally been playing this game since I got it and opening up another app game in my phone is impossible at this point. I think that the developers did a wonderful job on Hex Slide and I cannot imagine anyone not becoming hopelessly addicted to it after one game. AppSafari review of Hex Slide 10,000 was written by Vanessa Paszterko on December 2nd, 2010 and categorized under App Store, Board, Fun, Games, Puzzler, Strategy. Page viewed 5564 times, 1 so far today. Need help on using these apps? Please read the Help Page.